A 20-railroad car derailment near Dougherty Wednesday night halted train traffic, including the Heartland Flyer, throughout the day Thursday. Burlington-Northern-Santa Fe Railroad officials were confident the track would be open by this morning. 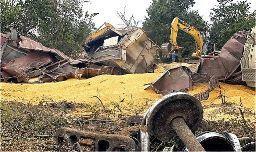 Joe Faust, Burlington-Northern Regional Director of Public Affairs, said 19 of the cars that tumbled about 9:30 p.m. while passing through the Healey Ranch 2.5 miles north of Dougherty carried grain. The other car was empty. By early Thursday afternoon all 20 cars had been unloaded and removed from the track. Joe Gordon, Murray County Emergency Management Director, said railroad crews and equipment were remained on the clean-up site. The cause of the derailment remains officially under investigation.